Racially inflammatory statements marked last night’s GOP debate on MLK Day. Martin Luther King Day would have been a perfect occasion for the GOP presidential candidates to express their commitment to racial tolerance and diversity. Instead, just the opposite occurred at last night’s GOP debate in Myrtle Beach, South Carolina. Who needs a dog whistle when you’re in a state where the Confederate flag still flies atop the statehouse grounds? WILLIAMS: Governor Perry, last month the Department of Justice challenged South Carolina’s new law requiring registered voters to show state issued identification before they can vote. Governor Haley has pledged to fight the federal government all the way to the Supreme Court. You sided with the government. WILLIAMS: Now, Governor Perry, are you suggesting on this Martin Luther King Jr. Day that the federal government has no business scrutinizing the voting laws of states where minorities were once denied the right to vote? PERRY: I’m saying that the state of Texas is under assault by federal government. I’m saying also that South Carolina is at war with this federal government and with this administration. Any segregationist governor could have uttered those very lines in the 1950s or 1960s. Later in the debate, Williams asked Gingrich about his incendiary suggestions that black Americans should seek jobs, not food stamps, and that poor children should work as janitors. “Can’t you see that this is viewed, at a minimum, as insulting to all Americans, but particularly to black Americans?” Williams asked Gingrich. Gingrich responded by saying that “New York City pays their janitors an absurd amount of money,” and that “only the elites despise earning money.” He also reiterated his claim that “more people have been put on food stamps by Barack Obama than any president in American history.” That statement is utterly lacking in context, failing to note that Congress expanded the food stamp program under George W. Bush and that the Great Recession forced many more people onto food stamps than in normal times. 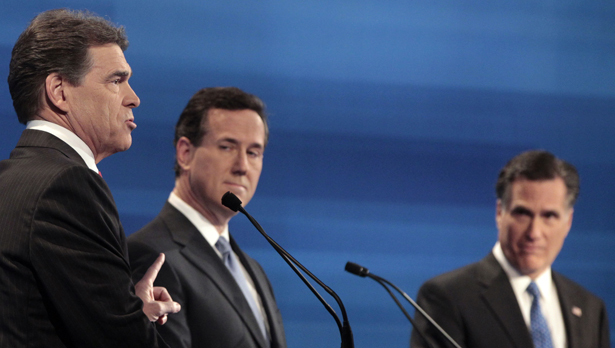 The GOP’s race problem doesn’t pertain just to Perry and Gingrich. Romney also voiced his opposition to restoring voting rights to ex-felons, which disproportionately disenfranchises minority voters, and said he would veto passage of the DREAM Act, which would give the children of undocumented immigrants who attend college or serve in the military a path to citizenship. The 2008 electorate was the most diverse in US history. But last night it sounded as if the GOP candidates were practically whistlin’ Dixie.